home is where they send us...: Get Lost in INDIA! Today, October 8th, 2013 we begin our JOURNEY to India! 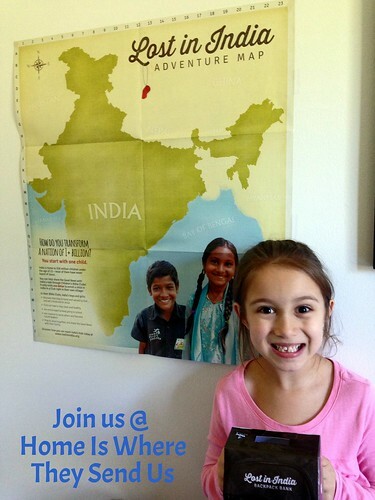 I signed the kids up for Lost in India - a program with Mission India and Sonlight Curriculum. It is a four week video adventure that brings India to us -- FOR FREE! We'll get to see different places, meet new people and understand life in India....it sounds amazing! Each Tuesday and Thursday, Chris, the tour guide will send us an e-mail to invite us on his next leg of his journey. The e-mail will contain the 4-7 minute online episode. We also will get bonus materials like: stories and photos about real kids in India, interactive activities and ways to connect with other families getting LOST IN INDIA! Our kit arrived last week and contained a map, backpack, sticker sheet and welcome letter!!! And...today starts the journey!!!! Here is the video we watched -- join in - you can watch, too! We are all excited!!! Check back for more posts on our journey! And, if you'd like to donate you can do so through our direct Lost in India page. I'm not sure if there is still time to join (GOOD NEWS - THERE IS!) and receive materials but definitely request them if you can! We got a great map and stickers to use after each episode! Here is Gator putting the first two stickers on our map!! !